As of today you will face a £200 fine and have your license endorsed with six penalty points if caught using a mobile phone whilst driving. Every year the police catch thousands of drivers using their mobile phone whilst driving, despite the government and local police forces persistently launching high profile campaigns aiming to deter people from doing so and highlight the danger. Today, the government are introducing new laws that increase the penalties faced by those drivers that are caught using their phone behind the wheel. Since 2003 it has been illegal to use your mobile phone whilst driving. This means that simply touching your phone, whether to use its’ sat-nav feature, check notifications or make a call, even if you’re using a hands-free kit, is against the law. The law applies if you’re at a standstill in traffic, stopped at traffic lights or pulled over with your engine still running. The only time that you could ever legally use your mobile phone behind the wheel is to call 999 when an emergency situation occurs and it would be unsafe to pull over. Using your phone or a two way radio to make phone calls whilst driving or riding is legal, as long as you don’t need to touch or hold the phone to do so. However, if the police think that you’re distracted then you could still be pulled over by them and penalised. 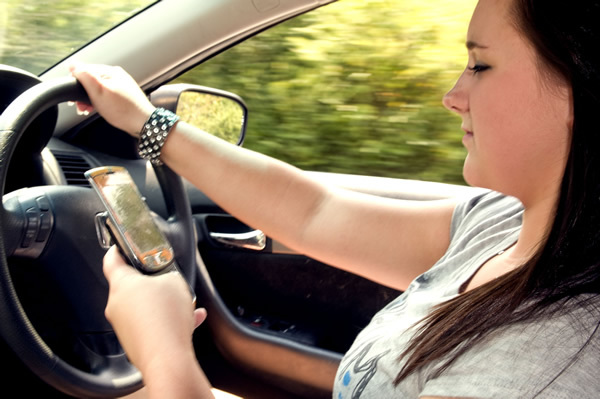 How much is the fine for using a mobile phone whilst driving? Originally drivers that were found guilty of using their mobile phone whilst driving received a fixed penalty notice of £30. In 2007 the government increased this to £60 and then increased the penalty to a fine of £100 in 2013. The latest increase, taking effect today, means that drivers caught using a mobile phone when driving will receive a fixed penalty notice of £200. There’s also a chance that your case could be taken to court where you could even receive a driving ban and face a maximum fine of £1,000 (£2,500 for drivers of HGVs or buses). There’s also the knock-on effect that receiving a driving conviction could have on your insurance costs; insurance for convicted drivers costs significantly more than insurance for somebody with a clean driver’s license. How many points do you receive for using your phone whilst driving? In the past you would have received three penalty points on your driver’s license, most likely accompanied by a CU80 conviction endorsement. The new law means that drivers will now be handed six penalty points on their license if they are caught using their mobile phone when driving. This is especially bad news for new drivers, who are only allowed to accumulate a maximum of six points on their license within the first two years of passing their driving test. This means that a new driver convicted for using their phone behind the wheel could be instantly banned from driving. In some areas of the country drivers would have been offered a remedial driving course for first offences instead of receiving penalty points, but the new legislation scraps these schemes as the government did not feel that they provided a harsh enough punishment. All drivers will receive six points for even their first offence. Why is it illegal to use a mobile phone when driving? Simply put; because it’s dangerous and can even be fatal. In 2014 the Department for Transport’s data shows that 492 accidents were caused when the driver was distracted by their mobile phone. On average 20 people are killed each year in Britain where use of a mobile phone was deemed to be a major contributing factor. When do the new laws come into effect? The changes to the law commence today, so make sure that you stay off your phone whilst driving to avoid a £200 fixed penalty notice and six penalty points on your license. New drivers need to be especially wary as they could find themselves banned instantly for using their phone. For affordable insurance with a CU80 conviction, have a look at our convicted driver insurance page to find out if Quote Chief can help you to save money.